RIO DE JANEIRO, Nov 3 2011 (IPS) - Inspired by the movement for real democracy and people’s power that has spread to hundreds of cities around the world, young Brazilians in Rio de Janeiro have created their own version of “Occupy Wall Street”, dubbed “Occupy Rio”. Following in the footsteps of Spain’s “Indignados” (outraged people), about 200 young people are carrying out a peaceful protest in one of the main squares in Rio’s city centre, where thousands of people pass by every day. Around 125 tents have been pitched in the Cinelândia square, where the city council, the municipal theatre and the national library are situated. The square has become the focal point of demonstrations criticising consumerism, social inequality and the financial system. Dozens of placards, reading “You are free”, “Come out of your living-room-prison, your life is worth much more than a soap opera episode,” or “Transform arms into art”, express the sense of peaceful protest and freedom that has inundated the plaza since Saturday Oct. 22. The global wave of demonstrations against the handling of the financial crisis has swept from Madrid, Barcelona and Málaga in Spain to New York, Oakland and Seattle, and on to other capitals and large cities across the globe. Joining the global tide of protest, “Occupy Rio” is characterised by its diversity and direct democracy through decision-making by assembly. 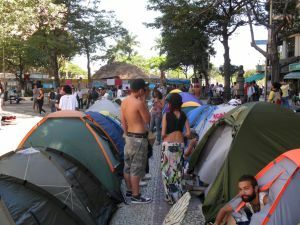 According to 18-year-old Eduardo de Oliveira Moraes, who is involved in organising the movement’s work groups, plurality is the hallmark of the encampment. Adopting a horizontal style of organising without hierarchies, people meet in the square for dialogue and discussion, seeking consensus, critiques or protests on widely divergent issues, including politics, economics, culture and the environment. “We’re also protesting against corruption and all kinds of wavering in the government,” de Oliveira Moraes told IPS. He was one of the first to show up in Cinelândia square at five a.m. on Saturday Oct. 22, ready to start the demonstration. “Everyone has their own reasons for being here. We have meetings and work group activities every day. We started off thinking we would stay for a week, but now we have no fixed date in mind to leave the square. We are here because this is where we want to be; this square is publicly owned and therefore belongs to us,” he said. The “Occupy Rio” movement is debating global issues like the financial crisis. But it is also discussing local political issues, while building bridges with local movements in the “favelas” or shanty towns, which are organising against forced evictions caused by the preparations and public works for the 2014 football World Cup and the 2016 Olympics, to be hosted by this city. Also on the movement’s agenda are the social and environmental impacts of hydroelectric dams in the Amazon jungle, like the Belo Monte project. Although there are no leaders and the watchword is self-organisation, a great deal of organising is necessary to keep the camp functioning. The group of about 200 protestors share the essential jobs like cleaning, security, and planning timetables for workshops and meetings, they explained to IPS. Food is provided by members of the camp themselves, or donated by city centre restaurants. “The movement’s self-organisation is not easy; everything is done by consensus. We are having some difficulties these days because of rain in the city, but there is no shortage of food. People have been very supportive and have given us tarpaulins and electricity generators,” 41-year-old Ronald Stresser told IPS. The activist said the global wave of protests is a result of the dissatisfaction and outrage people feel in an increasingly globalised and consumerist world. “The origin of the problem is our consumer society, and now that there are seven billion people in the world, the situation has become unsustainable,” Stresser said, adding that it was time to raise global awareness on the need for social changes. “The common goal is to build a better world for everyone. And it’s possible. The movement has already swept across many cities worldwide. We are getting stronger all the time,” he said. In Rio the movement has met with no opposition from the police, who have apparently gotten used to the presence of the demonstrators in the square. Twenty-seven-year-old Krishna Pada told IPS that the movement’s weapon of protest is poetry. “We are making poetry with our actions and our words. We are dedicated to self-improvement, and what matters is what each of us can contribute. The world that is controlled by money does not represent us,” he said. Wander Ferreira, a 28-year-old philosophy student, joined the sustainability group and looks after neglected flowerbeds in the city centre. “There are many neglected corners of the city centre that we are fixing up, or converting into urban vegetable gardens to grow our own food. It’s very gratifying work; this is a unique experience in my life, and in all our lives,” he said.